Downhill fun for everyone! Free wheel down Signal Hill and the lower slopes of Table Mountain on a Monster Scooter. Free-wheel down Signal Hill and the lower slopes of Table Mountain on a Monster Scooter! 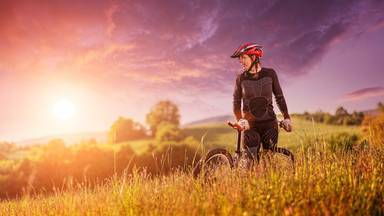 Not only will you have a n exciting downhill adventure but you will also experience the Mother City with all its breath taking views in a fun and active way. This guided 5 km track will take you down 2 adventurous off road tracks. The 1st leads down the side of Signall Hill into the colourful Bo Kaap. After the first downhill run the Experience continues as you are transported to Table Mountain for your 2nd run down a jeep track and single track off this world famous land mark! We had a fantastic time, thank you for you hospitality, would highly recommend it to anyone. ... - Glenda Clementi. Book things to do at Scootours Cape Town. 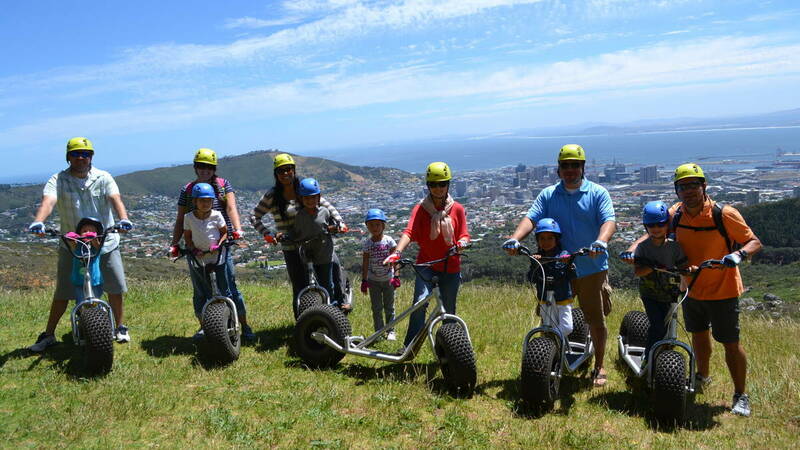 Find the best things to do at Scootours Cape Town. What people say about Scootours Cape Town. We had a fantastic time, thank you for you hospitality, would highly recommend it to anyone. Really good fun. The guides were funny and friendly. 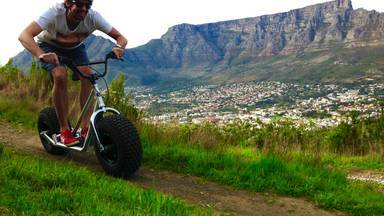 Highly recommend this adrenaline rush combined with fantastic views of Cape Town. We organised the Scootours for a hen party and Scootour were so helpful and adaptable to meet our needs. They were able to pick us up and drop us off at our Camps Bay location. Everyone loved the activity, the guides adapted to our speed and never left anyone behind. We would be free to ride for a long while and we had clear defined meeting points. It was brilliantly organised and routes gave such a great view of the city and ocean! We bought the photos they did at the end and they are great. Highly recommend as it is hard taking pictures as you do the activity. Awesome team building event, all team members commented on the brilliant event, scenic routes and great help from the assistants. Will definitely be back for another great event..soon. Busy recruiting members from my church group to do the same. Well done, keep up the great team work and spirit.